In a small bowl, whisk together the honey, soy sauce, lime juice and mustard. 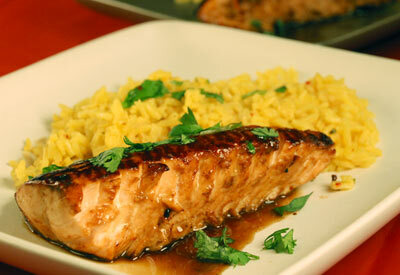 Marinate the salmon in the sauce in the refrigerator for several hours, or until ready to cook. In a nonstick skillet coated with nonstick cooking spray, cook the salmon on each side, 3 to 5 minutes, until golden brown, crispy, and just cooked through. Transfer the salmon to a platter. Add the remaining honey glaze to the skillet, and simmer, stirring, until the mixture comes to a boil. Return the salmon to the pan, heat thoroughly, and serve immediately.